If you were to write out an itemized list of all the items in your home for an after Christmas it’s clear the “after” list would be much longer. Take it is a whole all the presents that fit under the Christmas tree probably wouldn’t take up a lot of space in your home. But when you collectively start to add up years of stuff coming into the house, it becomes clear that storage is at a premium. This is why you should consider hiring Junk King Dayton in the New Year. 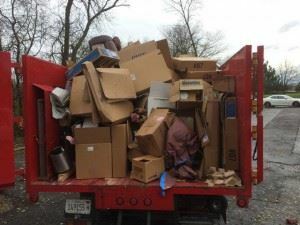 One call to these junk removal professionals will help you clear out plenty of space for all your new stuff. One of the most common things to get replaced at Christmas time are electronics. You might have brought in a new flatscreen TV, laptop computer, monitor, Blu-ray player or home theater system. Those are all fun things to play around with but it also means you now got a stack of electronic gear that’s been replaced. That is really no reason to hang onto those things and to get rid of them they need to be recycled at a certified facility. Junk King Dayton can ensure that all your e-waste will be dropped off at one of those facilities. That’s one less thing you have to deal with in the coming year. As you go to put away your new Christmas outfits you might become frustrated at all the stuff you have in your closet. This is another way that Junk King Dayton can be a huge benefit. Once you sort through all the clothing you have in the closet and decide what you never going to wear again that can become donations to charity. Junk King Dayton makes drop offs to charities every week of the stuff that they collect. They don’t like to see anything end up in a landfill that could still be used again. All of this hard work is going to be covered in a flat fee that based upon how tightly the crew will pack all your stuff onto the back of the truck. The less space they use the lower price you’ll pay. If you’re ready to make room for your new stuff, then give all your old stuff to Junk King Dayton. This entry was posted in Uncategorized and tagged Junk King, Junk removal, make room on December 31, 2016 by Junk King. Last updated August 8, 2017 .